It seems I may have taken the fortitude of the Red Squirrel completely for granted when waging my war on the furry little bastards. I entered the battle with the most humane of intentions. 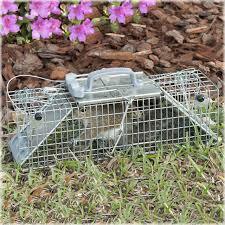 I brought home a live-trap so I could capture and relocate the hairy little mercenaries that have been seeking asylum in the walls and ceilings of my home. With my dog and I at sentinel posts, we have been rendered helpless and can only try to figure out how the bristly little vermin have been able to extricate themselves from their metal incarceration -twice! – and re-enter the sanctity of our home. I have not yet reached the moment when I clench my fists, indignantly throw my hands into the air and scream, “This means war!”. I am certainly bordering on enough sleep loss and misguided rage to window shop in the hunting section of the local Home Hardware. I have warned my co-workers – if I come in to work on Monday with traces of black dye under my eyes and remnants of any camouflage, things did not go well on the weekend. I can only hope if I reach Defcon One that I am a little more adept in the woods than Elmer Fudd!